Calamity Town is the first of Queen’s novels set in the fictional New England town of Wrightsville, ten thousand souls in the shadow of the Mahoganies. Give Me That Old-Time Detection’s editor Arthur Vidro has proven that Claremont, New Hampshire is the real-life model for Wrightsville, right down to the town square (which is round). The novel is one of my very favorite EQs. I vividly remember the first time I read it. The year was 1976, and I’d checked out The Wrightsville Murders omnibus from my local library. My affection for the book has only grown over the last forty years. I never had the opportunity to meet Dannay or Lee, but I feel I know them. I’ve read their books and I’ve read their letters. I got to know them even better when I decided to adapt one of their novels for the stage. Turning a book into a play involves the deepest kind of study and sympathetic magic. One becomes a literary safecracker, seeking the combination to unlock a book’s secrets and transpose them into another medium. A successful work of art is like a successful crime; it is an accomplished fact, something as beautifully constructed and functional as a Chase Manhattan bank vault. Given its place in the canon, Calamity Town would seem like the natural choice for an adaptation. However, I’d originally been drawn to the second Wrightsville novel, The Murderer Is a Fox, in which Ellery reconstructs—and finds the real solution to—a murder that took place over a decade before. The book has a dual time frame that struck me as very theatrical, with the past and the present existing at the same time. But there was also Calamity Town, a novel I knew well. I must have read it a dozen times over the years. Repeated exposure to the book fostered a greater appreciation of Frederic Dannay’s brilliant use of seasonal celebrations as an organizing principle. Patty Wright tells Ellery near the end of the book: “Every last awful thing that’s happened—happened on a holiday!” Dannay contrasts the warmth and nostalgia we feel for the holidays with cold-blooded criminal behavior. Manfred B. Lee’s evocative prose captures the look and feel of the town and the emotional highs and lows of its characters. Lee often felt he was the undervalued half of the EQ team, and with some justification. Although Dannay’s awe-inspiring ability to conceive brain-busting plots attracted a great deal of attention, the books wouldn’t exist without Lee. At his best Lee was a fine writer, equally capable of making a Grand Statement and selecting the telling detail. While I was contemplating which novel to adapt, I saw the Broadway production of The 39 Steps. The show is a very amusing, ninety-minute in-joke about Alfred Hitchcock’s film. I was taken with the unabashed way the production used narration, multiple casting, lighting shifts and an ever-changing, non-realistic setting. What if that approach were used to tell a more serious story? Wrightsville is a town torn apart by murder. Calamity Town presents a panoramic portrait of a town, and it made sense to me to use overtly theatrical devices to characterize Wrightsville and its inhabitants. A theatrical model existed long before The 39 Steps that used similar techniques. I’m speaking of Thornton Wilder’s Our Town, a play of simple means and dark truths. My adaptation would be Our Town—with murder. Vertigo Theatre in Calgary, Alberta, recently produced Calamity Town. Co-directors Craig Hall and Nathan Pronyshyn staged the play masterfully. On a raked stage of a blood red-brown, the nine-member cast moved light, specially made chairs and tables to indicate various locations. A sensitive soundscape provided period music and ambient sounds: train stations, crickets, ambulance sirens, the crackle of a tube radio warming up for one of FDR’s fireside chats. Stunning state-of-the-art projections transported the spectator from courtroom to jailhouse to moon-drenched midnight lawn; the effect was highly cinematic. The period-perfect costumes and, above all, the superb acting ensemble, made Wrightsville as real and familiar as your own backyard. Ellery and Patty Wright, dancing to Glenn Miller on the porch of Calamity House . . . John F. Wright’s understated and deeply moving graveyard recitation of Christina Rossetti’s poem “When I Am Dead, My Dearest” . . . Ellery, panama hat on head, suitcase in hand, silhouetted against a vivid blue sky of farewell. . . . These and dozens of other moments and images still resonate with me. Directly or indirectly, every mystery reminds us that actions have consequences, time is on the wing, death is inevitable, and life is precious beyond belief. Near the end of the novel, we find Ellery looking at the old elms before the new courthouse. too, in spring, thought Mr. Queen. Reading the Wrightsville novels and short stories that followed Calamity Town, one is saddened by the changing physical landscape of the town and the surrounding countryside and by the deaths of characters one has come to cherish. The truth of Ellery’s observation is unmistakable. Calamity Town, the novel, is dear to me. It cemented my affection for Queen’s work. I grew up in a town just about Wrightsville’s size and, even though my hamlet was in southwestern Minnesota, I saw its darkness and light reflected in Ellery’s New England. Welcome to Wrightsville, my friends. Ten thousand souls in the shadow of the Mahoganies . . . 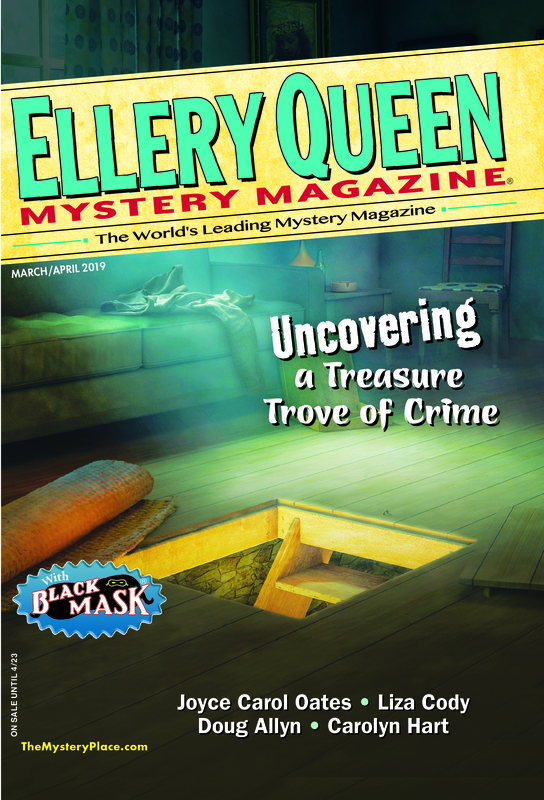 This entry was posted in Books, Characters, Ellery Queen, Fiction, Genre, Guest, History, Story and tagged adaptation, ellery queen, mystery, novel, play, playwright, stage, suspense, theatre. Bookmark the permalink. Lovely essay, Joe. I continue to hope that Calamity Town will find a venue that I can get to! Thank you, Dale! I’m hoping CALAMITY TOWN will make its way to you someday.